Target says it’s treating a potentially offensive goof in product labeling as a “learning experience" it won't repeat. Susan Clemens tweeted the discrepancy to Target, which responded quickly with an apology. “We never want to offend any of our guests. We apologize for any discomfort that we may have caused,” she told TODAY.com. 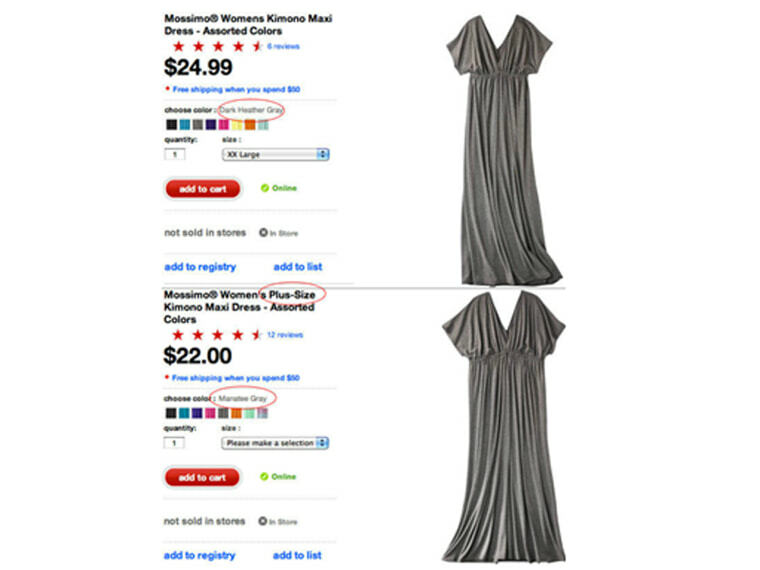 The “manatee gray” version of the dress in question, Mossimo Women's Plus-Size Kimono Maxi Dress, no longer appears on Target’s website. Deede noted that the color “manatee gray” is a seasonal color found on many products across numerous categories on the company website, including towels, rain boots and T-shirts. “We’ll use this instance as a learning experience so we can do better moving forward,” Deede said.